While Scandinavia is feeling the effects of the global volatility, few developed markets offer superior micro and macro benefits, which have driven the region’s long-term equity outperformance. When Hamlet puzzled about “the undiscovered country” while walking the grounds of Elsinor Castle in Denmark, he may as well have been speaking about Scandinavia as far as US investors are concerned. The four Nordic countries–encompassed by the United Kingdom, Germany, the Baltics, and Russia–are as foreign an investment destination as any obscure frontier market. They shouldn’t be. Together, Sweden, Norway, Denmark, and Finland make up a formidable economic region, as potent as it is unrecognized. Low-priced, cat-walk chic retailer H&M (known locally as Hennes & Mauritz), with stores spotting the major fashion avenues around the world, was one of the first in its industry to export its franchise beyond its home market. Volvo and Scania have a strong hold on the truck market. AP Moller-Maersk is the world’s largest shipping line. Novo-Nordisk is the leader in diabetes care. Ericsson is a major provider of telecommunications equipment and services. Bang & Olufsen is an iconic home entertainment systems maker. And Vestas Wind Power is in the forefront of alternative energy. Broadly speaking, Norway is the fifth largest oil producer in the world. Its $550 billion sovereign wealth fund, financed through surplus oil revenues, diversifies the country’s wealth and ensures its citizens remarkable security. In its latest study, the World Economic Forum identified Sweden as the second most competitive economy, two slots ahead of the US. “Combined with a strong focus on education over the years (ranked 2nd for higher education and training) and the world’s strongest technological adoption (ranked 1st in technological readiness), Sweden has developed a very sophisticated business culture (2nd) and is one of the world’s leading innovators (ranked 5th),” the WEF reported. While Denmark is overbanked and going through consolidation, Scandinavian banks in general are among the healthiest in the developed market. While hurt by expansion into the Baltics that turned sour during the recent recession, they have largely sidestepped the 2008 financial crisis. They maintain high capital reserves, and have very little exposure to troubled sovereign debt of Europe’s troubled economies. Banks’ sound status reflects the general health of local economies. Their fortunes are especially linked to a sound mortgage market that never went subprime, which demands around 15-20% down, and whose obligations are attached to individuals as well as to properties to help ensure continued performance. And since Scandinavian’s rarely if ever declare bankruptcy and have a solid safety net that offsets the financial hardships of unemployment and illness, mortgages get paid under most circumstances. So solid are mortgages that securities backed by their cash flow, known as covered bonds, qualify as capital reserves for banks. Government finances are also sound. All four countries ranked within the top 10 of Institutional Investor’s 2011 Sovereign Credit Ratings of 178 countries, with the number 1 spot going to Norway. -1.7%, while Sweden’s balance is expected to turn positive to 0.2%. Norway’s budget surplus should exceed 13%. Debt levels, as a percent of GDP, are benign. Denmark, Finland, and Sweden are between 47%-49%; Norway’s is 36.6%. And except for Finland, whose current account balance is fractionally negative, the rest of Scandinavia’s current accounts are in the black. In contrast, the US is running a 9% budget deficit, net public debt is 66.1% of GDP, and it has a current account deficit of 3.2%. Scandinavia’s positive macro picture is a reflection of the region’s economic health. After contracting 4.57% in 2009 on a GDP-weighted basis, economic growth bounced back in 2010 by 2.84%. And the EIU projects 2011 expansion of 2.08%, with Sweden leading the pack expanding at a 3.7% clip. These positives have been underpinning equity market performance that’s been outperforming the developed world. According to the Morgan Stanley Capital Indices, three-year annualized total returns of the Nordic region through November was 18.84% annualized in US dollar terms. That’s 4.31 percentage points more per year than the MSCI US Index and 8.21 percentage points more than the MSCI EAFE Index, which measures developed stock market performance excluding the US. Over the trailing five years, Scandinavia was down 62 basis points a year, while the US broke even and EAFE was down 3.5%. And over the last decade, Scandinavian shares have generated annualized total returns of 8.05%, more than 5 full percentage points better than US stocks and outpacing foreign stocks by 2.77 percentage points. If this pans out, then this could bring an end to the temporary disconnect between Scandinavia’s compelling fundamentals and recent market underperformance. Funds are an easy way to gain diversified foreign exposure. Unfortunately, echoing the region’s little tracked status, few funds are offered in the states. A preliminary search turned up only one actively managed fund, the $337 million Fidelity Nordic Fund. Fidelity manager Per Johansson is enthusiastic about the region’s corporate culture because of its sophisticated, transparent approach to management, high governance standards, delegation of authority, emphasis on return on capital over pure revenue growth, and focus on shareholder returns. However, over the short- and longer-term, the fund has trailed the MSCI Nordic Index. Global X offers the only ETF that tracks the FTSE Nordic 30 Index. The firm also offers the only Norwegian-focused fund, which tracks the local FTSE index. While both are relatively new and small funds, the latter’s assets are more than twice the regional ETF’s, reflecting market demand for exposure to Norway’s oil-rich economy and a currency that’s buoyed by the country’s wealth, according to Global X CEO Bruno del Ama. Blackrock’s iShares Sweden fund provides exposure to Scandinavia’s largest economy, whose GDP represents nearly 35% percent of the region, and a bourse that accounts for about half the region’s market capitalization. Except for the past year, the ETF has outperformed the Nordic index over the medium- and longer-term. Senior iShares portfolio manager Greg Savage believes the argument for Sweden is its comparatively large, diversified economy that offers investors exposure to the local and regional markets, as well as to global leaders. Savage adds that underlying shares are liquid. And they are denominated in a solid currency that should sustain its value. With limited fund options, investors and advisors who can regularly track companies should also consider direct investments in Scandinavian shares. Many of the large, leading names trade as American Depositary Receipts on the New York Stock Exchange or Over-the-Counter. The most familiar is fashion retailer Hennes & Mauritz [OTC: HNNMY]. The Stockholm-based firm has successfully jumped across national borders by collaborating with major designers and inexpensively churning out new, affordable lines. A key target has been China, where H&M has been rapidly growing market share in tandem with rising disposable income. While the stock is off more than 7% this past year through November, shares have risen annually by nearly 24% over the past three years. And Barclay’s Capital retail analyst Karen Howland believes gross margin expansion driven by same-store growth of 3.2% in 2012 should substantially drive H&M’s shares. After expanding across Scandinavia, incumbent Oslo-based service provider, Telenor [OTC: TELNY], turned east to Central Europe, the Balkans, and Russia, and then to Asia, including Thailand, Malaysia and India. Shares have rallied strongly since the financial crisis, appreciating at annual clip of 50% over the past three years. With three-quarters of its revenue generated abroad, Deutsche Bank telecom analyst David Wright believes top-line growth will continue to accelerate “thanks to its best-in-class GDP footprint.” Combined with disciplined cost and capital spending, Wright anticipates further earnings and cash flow expansion. And if the dividend is increased by 22% a year over the next three years, as the firm has targeted, this could significantly boost the company’s current yield of 4.37%. The world’s largest maker of insulin, Danish health care giant, Novo-Nordisk [NYSE: NVO], has seen its share rise by more than 31% annually since the start of the financial crisis in late 2008. Fueling the company’s long-term growth has been the global expansion of diabetes. Carnegie Investment Bank’s head of equity research Peter Hansen explains Novo uniquely retains its competitive lead through constant innovation and patenting of new drugs that shelters the firm from material loss due to generic competition. He also cites sound, long-term management whose shareholder friendly approach returns 5% annually to investors through share buybacks and dividends. He sees bottom-line growth of 15% going forward over the next two years. While Scandinavian fundamentals remain sound, the region stands perched on the doorstep of the world’s largest systemic risk: the potential breakup of the eurozone. This, along with sluggish world growth, has produced substantial market volatility across the region. This makes local shares vulnerable over the short term. Some observers argue that politicians will eventually get a handle on the crisis and avoid shocking the global economy. Even if this proves out, the torturous route leaders are taking to get that point is generating turbulence to all peripheral and distant economies. And if they fail, the impact of a eurozone breakup is too difficult to predict. Regional recession would be a virtual given and that can’t be good news for Scandinvaia. Whatever plays out, Scandinavia will most likely retain its safe haven status, and it’s currencies–especially the Norwegian and Swedish kroner–would likely appreciate. This would translate into higher valuations for dollar-based investors. But it could hurt exports. A slowdown in emerging market growth is another risk. Jan Storup Nielson, Nordea’s senior economic analyst, recalls Scandinavian vulnerability to the Baltic states was revealed during the financial crisis when many markets feared they would be the source of a rash of bad debts. Conditions have since tempered. Today, with half of the Nordic growth geared to exports, Nielson’s main concern is decelerating Chinese growth. Contrary to our aversion to paying taxes, the Scandinavia model of high progressive tax rates and spending appears to be working very well. 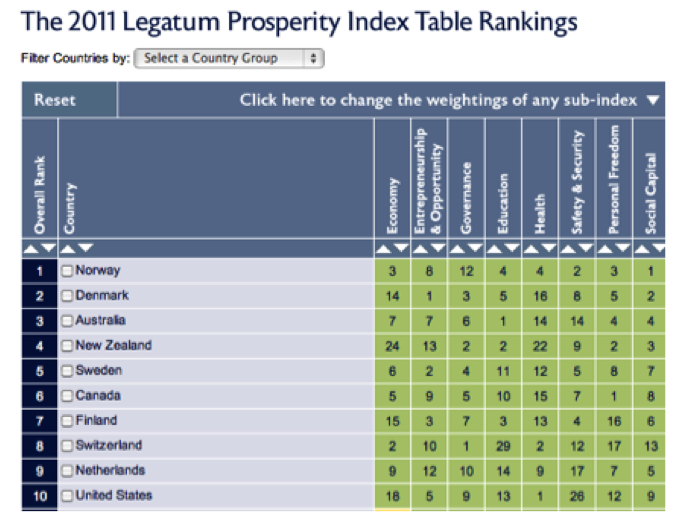 In its 2011 Prosperity Index, which tracks 8 key components ranging from economic opportunity and growth, education, wealth, and government, the independent London-based Legatum Institute ranked the four Nordic countries in the top 7 out of 110 countries studied. Perhaps pure-market conservatives will be surprised to learn Scandinavia’s emphasis on a healthy society has fueled some of the most compelling investment returns around. They shouldn’t be. This entry was posted on Tuesday, December 13th, 2011 at 5:05 pm	and is filed under COUNTRIES, INTERNATIONAL INVESTING. You can follow any responses to this entry through the RSS 2.0 feed. You can leave a response, or trackback from your own site.